This past week Chris and I were busy stepping up 1600 small lavender plants into four-inch pots that will be sold at the spring herb festivals and the farmers market. It’s dirty work and while potting the first half of the plants we managed to stay snug and warm inside the greenhouse, which is your average 10×30 ft hoop style. Before long there was no more room inside for our special mix dirt-pile (a mix of organic potting soil, wood ash, and sand) as the plants would require nearly every inch of space. We moved the whole operation outside and finished up working off the tail end of our flatbed trailer. The greenhouse is now full and we’ve entered that pre-spring phase that includes constant monitoring the greenhouse temps throughout the day, opening vents in the plastic when it gets warm from the sun or firing up the propane heater when the temperature drops in the evening. 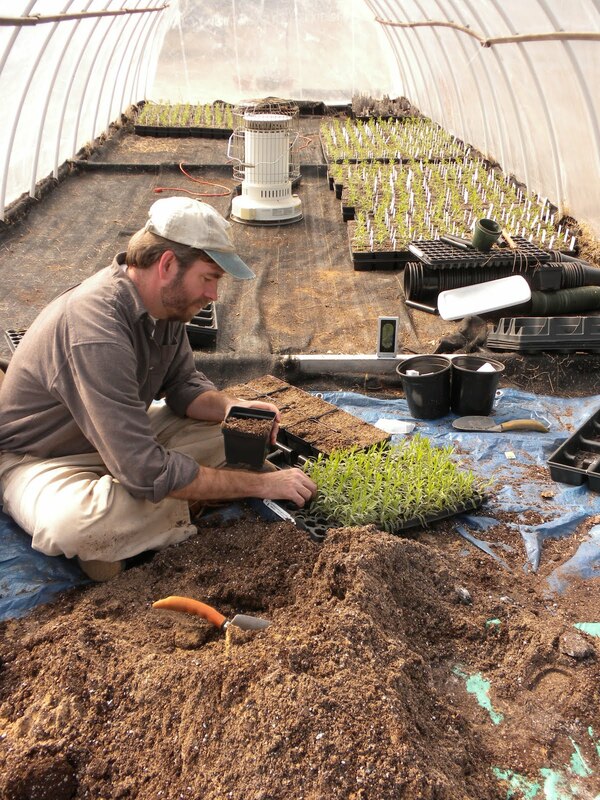 There is a certain yearning that begins to creep into me when greenhouse season begins. I think it has to do with the smell of the soil and also to do with the shaking off of the dark season of winter, deep in my spirit. The rest and quiet time I’ve enjoyed the past few months will help fuel the energy that the coming spring requires. While the calendar we in civilized society generally adhere to tells us that the new year began in January, it feels so much more to me that this is the beginning.While we sat on the end of the trailer working my eyes rested often on the old raised beds that we moved from behind the farmhouse last year. This year I’m beginning a new herb garden in the old beds somewhere near our new house. (Is it still a new house if it’s nearly a year old?) Last year I missed not having fresh herbs other than what was in the field and a few scattered containers. I’ve got must-haves on my list, many culinary, but I want to venture out into the unusual herbs as I did years ago. Whether you’re a farmer or a gardener or just have a few pots in the window sill, the smell of the soil – the earth itself – can be most bewitching. I’m ready to get down and dirty again.